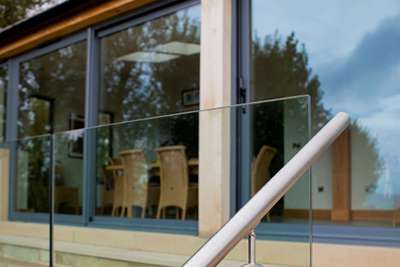 Despite the rise of bi-folding doors in many homes across the UK, patio sliding doors still remain a popular choice. This is because they are often a little less expensive than bi-folding doors and can be installed in every open space available. Below our team at Clear View look at some of the great benefits and facts about sliding doors that you may not know. For example did you know that sliding doors can be up to 3 metres in width and 3 metres in height? This means that if you have a large open space where you want to have an unobstructed view, a sliding door would be a very good choice. If you intend to open this space frequently however a bi-folding door maybe a better alternative, but if this is going to remain closed for the main, choose a sliding. They can also be included in a curtain walling system as a sliding door would allow for less framework to be on display and more glazing. Another great benefit to sliding doors is that they just take up the space of a frame. This makes them a very popular choice in small areas where you may wish to enhance the natural lighting to make it appear bigger. A good example of this is in a small office room at the rear of a property. You will get natural light almost all around if it is south facing as you may want it to appear slightly bigger when you walk in, drawing attention away from its size. Another really great fact about sliding doors is that they are very technologically advanced. You can open them simply via a push down button system. If you are careful when using them and carry out regular maintenance they will last a long time. They should also move smoothly and they should allow both young and elderly to open them repeatedly at ease. For more information or to contact us about any of your enquiries and requirements please don’t hesitate to contact us today. From our base in Yorkshire, we can serve the whole of the North of England including Leeds, Birmingham and Newcastle.